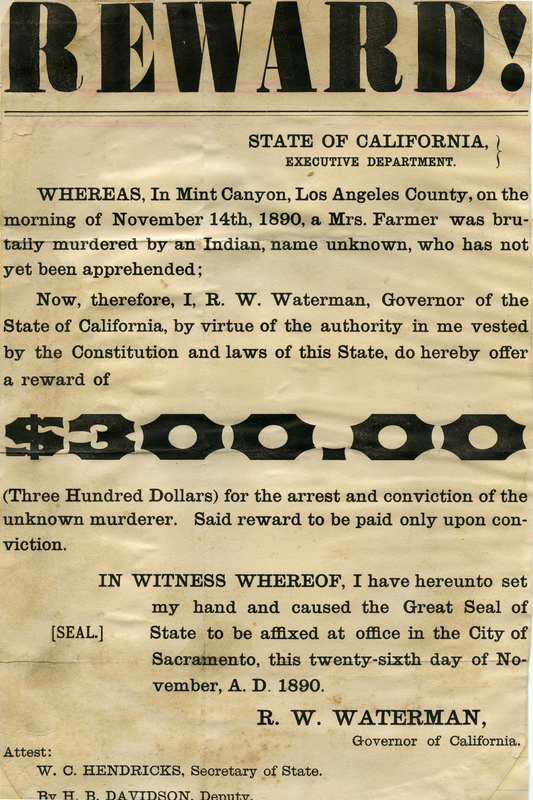 Reward Poster For Apprehension of Indian Murder Suspect, November 26, 1890. The victim was Hattie Melrose Farmer, older sister of Norman "Rosie" Melrose, who would be embroiled in his own murder case 13 years later. The Farmers were listed as living in Mint Canyon; they most likely lived in the section of Mint Canyon that we would call Agua Dulce today. California Views from the R.W. Waterman Family Papers, ca. 1865-1900. Robert Whitney Waterman was born December 15, 1826 in Fairfield, New York. At the age of 13 he moved to Newbury, Illinois to join his older merchant brothers as a clerk, and a few years later established his own business. In 1847 he married Jane Gardner in Belvedere, Illinois. In 1850 Waterman sold his assets to finance a journey to California. He traveled with F.A. Park, and, while staying in Salt Lake City, befriended Brigham Young. Upon his arrival in California, Waterman joined one of his brothers as a miner at Oregon Creek, near the South Fork of the Feather River. Waterman returned to his family in Wilmington, Illinois in 1851 and became a successful grain dealer. As a result of his involvement in state politics, Waterman was chosen to be a delegate to the 1854 Republican Party convention in Bloomington, Illinois, and was later instrumental in helping Abraham Lincoln carry the state in the 1860 presidential election. After further ventures in business and politics in Illinois, Waterman returned to California in 1873, becoming a machinery salesman in Redwood City. The following year he moved to San Bernardino County, where he would soon return to mining. In 1880, with J.L. Porter, Waterman founded the Calico Mine, a silver mine near what is presently Barstow, which became extremely prosperous for him. Waterman was also the owner of the Stonewall Gold Mine, the Cuyamaca Ranch, and the Cuyamaca Railroad, all in San Diego County. In 1886 Waterman was nominated by the state Republican convention as its candidate for lieutenant governor. Waterman won the election, while Democrat Washington Bartlett was elected governor, marking the first occurrence of such a split in state history. Waterman became California's seventeenth governor when Bartlett died after only a few months in office. Waterman's administration suffered from his lack of experience in public office and poor advisory support. R.W. Waterman died in San Diego in 1891, shortly after his term as governor had ended. AL1890: 9600 dpi jpeg from original document, collection of Alan Pollack.